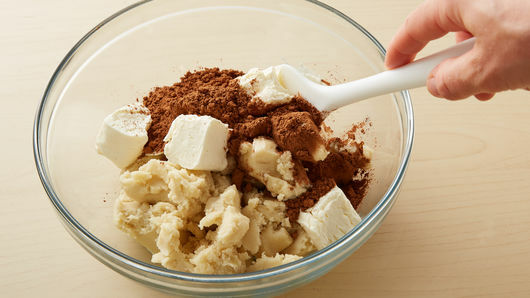 In large bowl, crumble cookie dough; stir or knead in cocoa and cream cheese until well mixed. Shape tablespoonfuls dough into 24 (1 1/2-inch) balls. Place 1 inch apart on ungreased cookie sheet. Bake 10 to 13 minutes or until edges are set. Remove from oven. 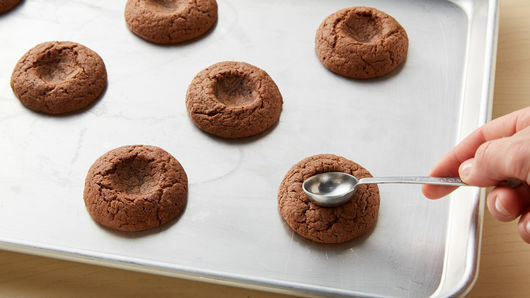 Using back of round metal measuring teaspoon, make 1-inch indentation in center of each cookie. Cool 1 minute on cookie sheets; remove to cooling rack. Cool completely, about 30 minutes. In medium microwavable bowl, microwave dark chocolate chips, whipping cream and butter uncovered on High 1 minute to 1 minute 10 seconds, stirring every 30 seconds, until melted and smooth. Spoon generous 1 teaspoonful chocolate mixture into indentation in each cookie. 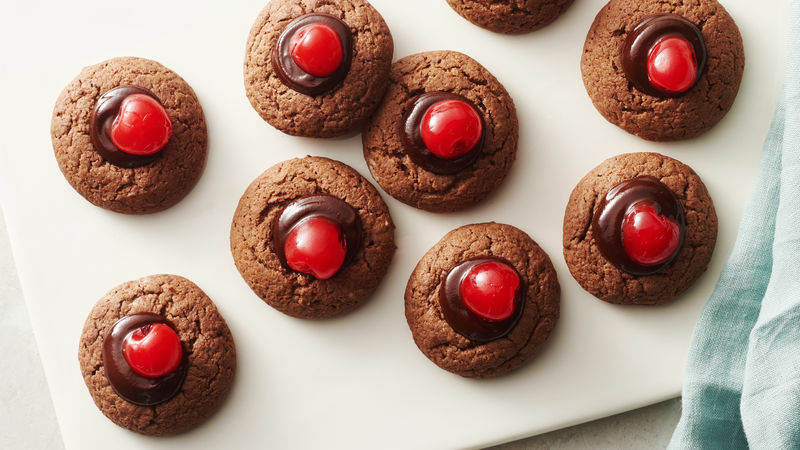 Top each cookie with 1 maraschino cherry. Let stand about 30 minutes or until chocolate filling is set. Store covered in refrigerator. For a festive touch: In small microwavable bowl, microwave 1/4 cup white vanilla baking chips and 1/4 teaspoon vegetable oil uncovered on High 30 to 60 seconds, stirring every 15 seconds, until melted and smooth. 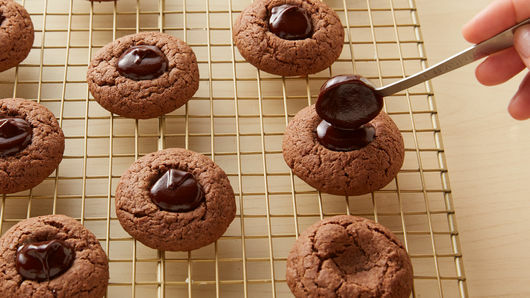 Drizzle over cookies, or sprinkle cookies with powdered sugar. Don’t have a round measuring teaspoon? Use end of wooden spoon to make 1-inch indentation.